The HP Deskjet 3050 is a general-purpose printer, efficient for performing high printing jobs. 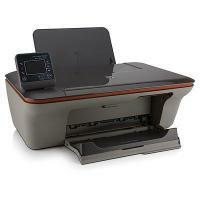 It lets you easily copy the documents, monitor your print jobs and manage the ink supplies, directly from the printer. Designed to have 38mm LCD display, and weighs 3.6 kg, it can print with the speed of 4 ppm (ISO) for monochrome and 5.5ppm (ISO) for colour, making it popular between the users who want to print large number of documents in less time. With the adequate printing speed, it can print on a variety of different paper types such as normal paper, envelopes, photo papers, labels, and transparencies. Adding on to this, HP Deskjet 3050 has built-in wireless connectivity option which ensures that you can access the printer from anywhere in the house. It also has low power consumption which makes it cost-effective. With the considerate design, replacement of the HP Deskjet 3050 Ink Cartridges doesn’t take too much time and it's easy to do. Maintaining a decent standard of printing, the printer has easy set up options and does not require much time on installing the printer. Reliable and perfect for everyday home use, it can be easily accommodated thanks, to its space-saving design. The HP Deskjet 3050 is an all-in-one inkjet printer that comes with the added functionality of copy and scan. It has a great print speed as compared to other printers of its range but has an average print quality. With the large paper handling options this printer, and can be used at the places where you require chunks of documents to get printed without worrying much on its quality. How to replace the dried ink cartridges with the new HP Deskjet 3050? Step 1: Check the power of the printer. Make sure it is turned on. Step 2: Load the paper to the printer. Open the cartridge door and wait for print carriage to move to center of the product. Press down to release the cartridge, then remove old cartridge from the slot. Carefully remove the cartridge from packaging and remove the plastic tape using pull tab. Step 6: Align the cartridges. The cartridges should be aligned properly in order achieve best print quality. How to align the HP Deskjet 3050 ink cartridges from the Printer Software? Step 1: Load a letter or A4 unused plain white paper into the input tray. Put the paper correctly and make sure that it is not wrinkled or curled. Step 3: Click on align ink cartridges tab. The product prints an alignment sheet. Step 4: Load the cartridge alignment sheet on the right front corner of the glass. Even after aligning the printheads, the print quality does not improve, try replacing the cartridges that will probably help to resolve the issue. Q. Is there a chance of ink in compatible HP Deskjet 3050 ink cartridges causing permanent stains if it falls on any surface? A. Yes, the ink can create permanent stains if it comes in contact with surfaces around you, so please take precautionary steps to prevent it such as placing printer on a newspaper or a cloth. Q. My work involves a great deal of multi-purpose printing of images round the clock. Would you recommend compatible HP Deskjet 3050 ink cartridges? I have been using original brand cartridges and I can’t compromise with quality but need to cut down on costs. A. You can look forward to the same quality, consistency and experience with these compatible ink cartridges at a fraction of the cost you incur by using the original brand. Features like integrated printhead, ease of installation, handling and usage assure you of great output and tremendous savings for printing fine quality multi-purpose images and documents with these ink cartridges. Q. What should I do to get next day delivery of HP Deskjet 3050 ink cartridges from you? A. You just need to place your order before 12 noon (Monday to Friday) so that we can dispatch the ink cartridges for next day delivery. Q. I have an HP Deskjet 3050 printer at home which I don’t use too often. Will standard-size HP Deskjet 3050 ink cartridges be suitable for me or high-yield ones in your opinion? A. Standard-size ink cartridges would be more suitable for you as you don’t print frequently. Ideally, cartridges should be used up within a limited time before the ink in it starts degrading, which affects the quality of the print. If you use a standard-size cartridge, the ink will get exhausted eventually and you won’t have spent much on it. Buying high-yield cartridges is costlier and if the ink isn’t exhausted on time, it will be wastage for you. Q. How can I cancel the current print job? A. To cancel any job that is pending or in progress from either the printer or the computer totally depends upon the printer model you are using. Press the Cancel button, or if your printer LCD screen displays that the print job is in progress, touch on the X to Stop, or Cancel. Canceling from the control panel stops the job currently in progress. It does not cancel any other print jobs pending in the print queue. If your printer does not contain any Cancel button or the print job progress is not displayed on the screen, cancel the job from a computer or the device you sent it. Q. Will I get any difference in print quality If I use compatible ink cartridges for my HP DeskJet 3050 printer? A. Yes, we at Printerinkcartridges.ie tried our best to get you with the good quality products that won’t affect your printer, that is why all of our compatible HP DeskJet 3050 ink cartridges are tested to the highest quality standards to give you the same high-quality printouts and page yield as you get using the equivalent original ones. Q. Is cash on delivery available at your site? A. Unfortunately, we have not started cash on delivery services yet for our customers. However, you can make payment through your debit/credit card and can also make a payment by PayPal. Q. How will I be able to detect the defective cartridge? A. If both the tri-color and black HP DeskJet 3050 ink cartridge lights are blinking, and the power light is switched on, it might be possible that both cartridges may still have tape on them or are missing. Firstly make sure that the tape has been removed from both the cartridges, and that the cartridges are installed correctly in the correct cartridge slot. If both cartridge lights are still blinking, then one or both cartridges may be defective. Replace the HP DeskJet 3050 ink cartridge referring your user manual. Q. What if I ordered the wrong cartridges for my HP DeskJet 3050 printer? Can I return them back to the courier person? A. Please don’t do that. We have a flexible return policy where you can easily return the non-faulty item or can either exchange it with the right one. Please return the item in its original undamaged packaging with all of its components by post or courier. Once we receive an order back, will place a refund in your account. Q. I am installing the HP DeskJet 3050 printer for the first time. Can I install it without any outside help? A. Yes, the printer comes with very easy setup options and can be installed correctly without any outside help. You just need to follow the instructions given in your user manual and the general safety measures to be kept in mind while installing it. Q. What consumables are included in this printer? A. The printer supports one cartridge (black) that can print up to 480 pages and one cartridge (colour) that prints 330 pages if you print using remanufactured HP DeskJet 3050 ink cartridges. Q. What to do when HP DeskJet 3050 printer produces faded prints, missing or banded prints or has no prints? A. The feature-packed HP DeskJet 3050 printer offers wi-fi connectivity and uses HP DeskJet 3050 ink cartridges as consumables. Though the printer is equipped with heavy printing jobs, it is normal to encounter with the print quality issues like faded prints, missing or banded prints. The most likely causes of these type of problems can either be a low or empty level ink cartridges or clogged printhead nozzles. Try cleaning the blocked printhead. If the issue is still not solved, we would suggest you replace the low or empty HP DeskJet 3050 ink cartridges.